In order to increase user productivity and reduce IT costs, Intel IT plans to make getting a new laptop or switching from one device to another as easy as getting a new smartphone. Historically, our users spend, on average, several days reestablishing their workspace (corporate and personal content, applications, and user personalization) on a new device. Quite often, they require considerable ...assistance from IT staff. We are in the early stages of decoupling the user workspace from the OS and hardware to enable our vision of a seamless user workspace that follows the user from one device to another. Using a cloud-based approach, we have implemented this vision for Windows*-based devices; we plan to extend the same technique to include devices running other operating systems. Users can more quickly reach the same level of productivity on the new device as on the previous one. 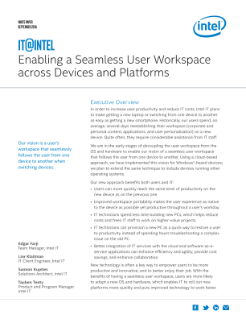 Improved workspace portability makes the user experience as native to the device as possible yet productive throughout a user's workday. IT technicians spend less time building new PCs, which helps reduce costs and frees IT staff to work on higher-value projects. IT technicians can provision a new PC as a quick way to restore a user to productivity instead of spending hours troubleshooting a complex issue on the old PC. Better integration of IT services with the cloud and software-as-a-service applications can enhance efficiency and agility, provide cost savings, and enhance collaboration. New technology is often a key way to empower users to be more productive and innovative, and to better enjoy their job. With the benefits of having a seamless user workspace, users are more likely to adopt a new OS and hardware, which enables IT to roll out new platforms more quickly and puts improved technology to work faster.